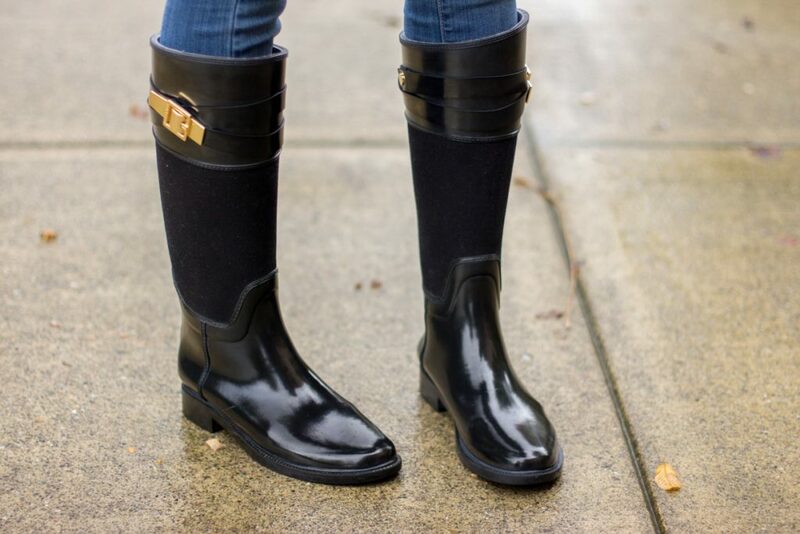 Rain boots are one of those things in my shoe closet that I never thought I would get a lot of wear out of until I owned a pair. 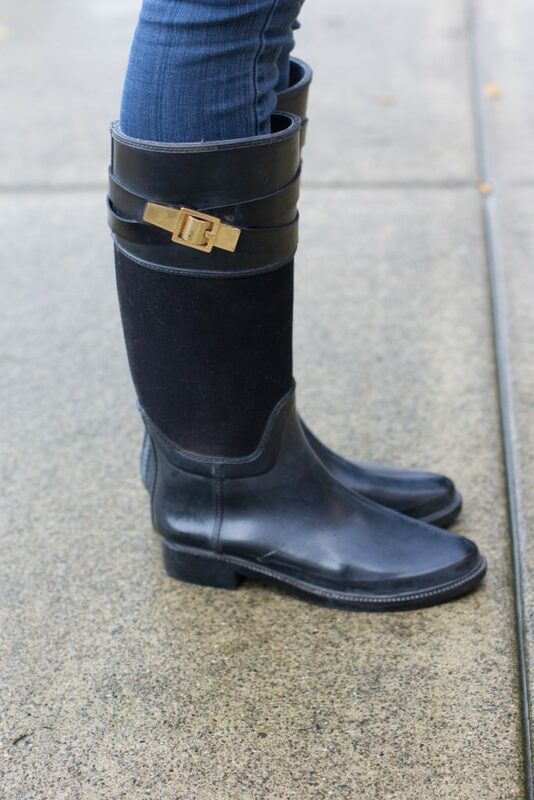 With all that Seattle rain, I found myself wearing them more often and needing to invest in a better pair. I’ve actually never had a pair of Hunter boots. 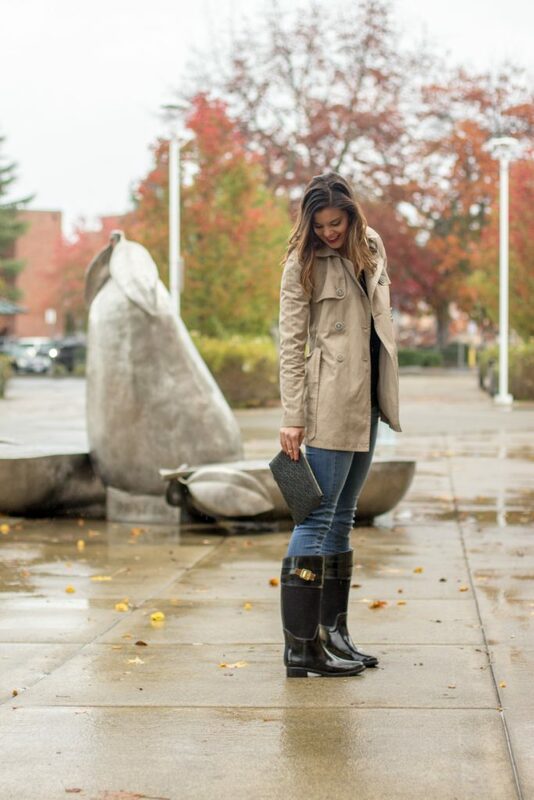 My first pair of rain boots were from Target. Finally, I upgraded to some adorable Ted Baker boots that I fell in love with upon first sight! The gold plated bar and fabric section separated this boot from all the rest. I was so excited to finally have a quality pair that the care for them escaped me. It wasn’t until I noticed a white powdery substance appearing on them that realized I was doing something wrong! Here’s what I didn’t know about rubber. True high-quality rubber when exposed to air, dirt, and water, will cause the surface to expose a white residue that looks chalky due to oxidation. This is called “blooming.” When this first happened I freaked out! Thankfully there are easy ways to get rid of this. I recommend buying some Hunter rain boots spray cleaner. No, they didn’t not sponsor this post! 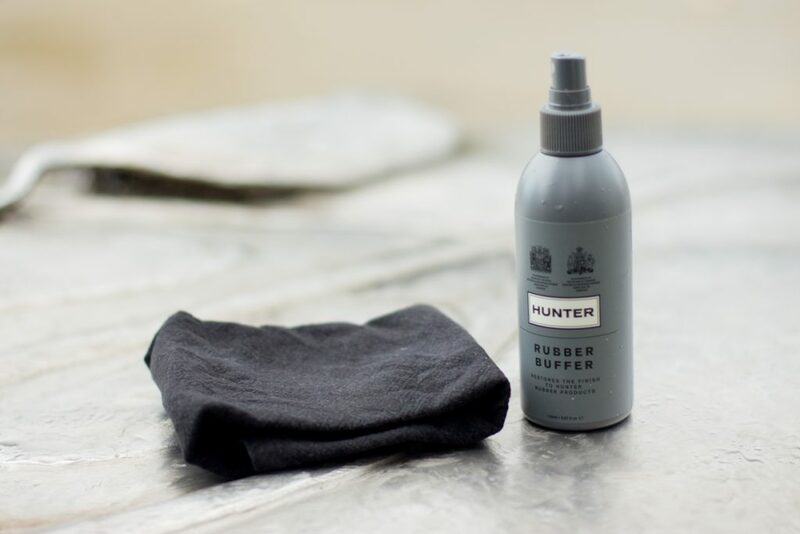 I first tried soap and water, and even oil, but nothing even came close to removing the residue until I used this Hunter Rubber Buffer spray. The directions are easy! Spray the cleaner and wipe with a washcloth until the residue is gone. I ended up doing quite a bit of buffing, but the end result was beautiful and definitely worth the extra effort! Cleaning them after each use is the best way to keep them looking in tip-top shape. This will help prevent any further residue from forming. Soap and water should work just fine for this. Also, store the boots in a cool, dry place away from heat or sunlight which will prevent them from causing further blooming. Wow, this is pretty useful Information! I did not know this about rainbows!! Must Pin this, LOL. Thanks for the tip! You’re welcome Robin! Thanks for the sweet compliments! I figured they needed to be cleaned anyway so better off make a post about this! Wow! This is a great post! Very useful information my love! Thanks for sharing.. I always have the same problem with my shoes! will defiantly buy this spray. Wishing you a wonderful day sweetheart. I’m so glad you think so, thank you! Gotta love good quality rubber rain boots! If you have to wear them then I suppose you better look cute doing it! Hey gorgeous – this is perfect timing! I’ve never owned rain boots, but they’re predicting crazy rain with this El Nino system this year, so I’ve been looking into getting a pair. This is very helpful!! Oh really!? That’s so awesome! I hope you find a cute pair! It makes rainy days better! This is super informative Molly! I’m horrible when it comes to polishing and spraying my shoes before I wear them.. hahaha. My rain boots are still in pretty good shape because I just got them last year, but will consider getting this once they need a bit of polish! I’m horrible about polishing them too, but I am getting better at it because it’s important to take care of your boots! It’s must easier to keep up with the upkeep when you do it often! I got a pair of Hunters for Christmas and just this morning I was looking at them thinking, “Hm I wonder if there’s a special way to care for them or if you just leave them because they’re rubber?” It’s like you read my mind with this post, I’m totally buying this spray! THANK YOU!! !